The Water Warriors Hydra Pak (originally known as the Aqua Pak) is the first backpack soaker in the Water Warriors arsenal. For an initial entry, it is a uniquely designed blaster with some nice features and interesting behaviour as a result. While pumpable, the pump is placed on the backpack as opposed to the blaster portion, resulting in a smaller blaster profile. 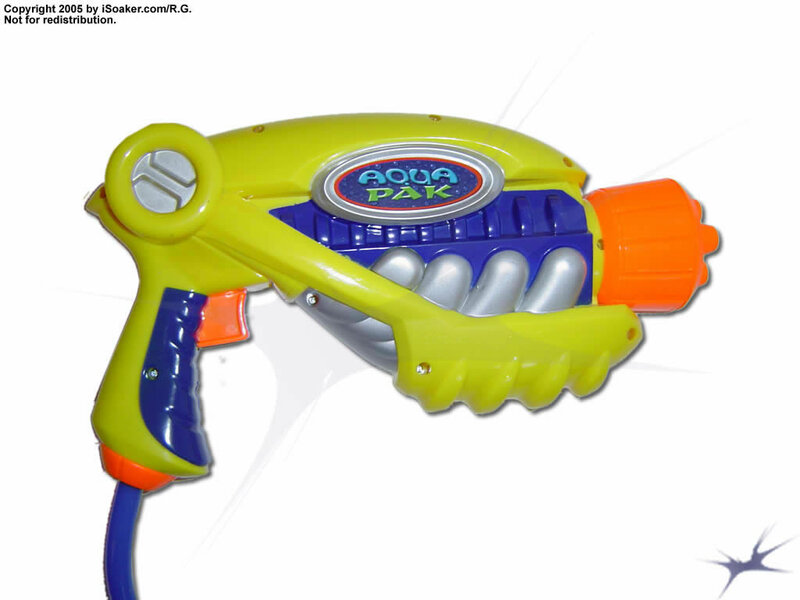 The performance is akin to the Super Soaker SC Big Trouble though, unlike its counterpart, the Hydra Pak is not limited as it does not require a Q.F.D. to fill. The Hydra Pak features 4 nozzle settings: the first three are stream settings of varying sizes while the fourth is a fan setting. All nozzles are well fed by the large pressure chamber and produce good streams. The smallest nozzle offers the best amount of water conservation. On a fully charged pressure chamber, the small stream can shoot continuously beyond 2 minutes! The mid-sized stream appears to have the best consistency of the settings. Shot time is reduced compared to the smaller stream, but output is enhanced. Shot time is still very respectable thanks to the large firing chamber capacity. Unfortunately, the largest stream, while pushing out the most water per second, feels under-powered. The largest stream feels as if its strength is limited due to the length of the hose, thus shows stream arcing earlier on. The fan setting works nicely for good, close area coverage. The main shortcoming of the blaster is its lack of a pressure gauge. This is, however, only a minor point of complaint and does not seriously reduce the user-friendliness of this soaker. The trigger and grip area is nicely moulded and easy to hold. With the pressure chamber pushed into the backpack, the blaster component of the Hydra Pak is quite small, making it easy to aim and blast as needed. The trigger has a nice feel to it, though appears it can be pulled to open the nozzle valve at different amounts (not a Max-D-type trigger). 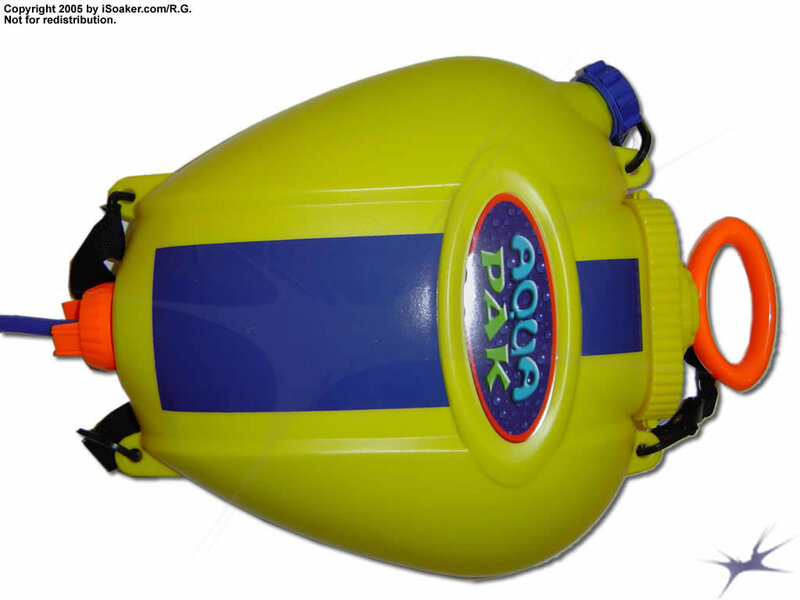 The Hydra Pak's reservoir holds a great deal of water; more than Super Soaker SC Big Trouble or Super Soaker SC Power Pak. 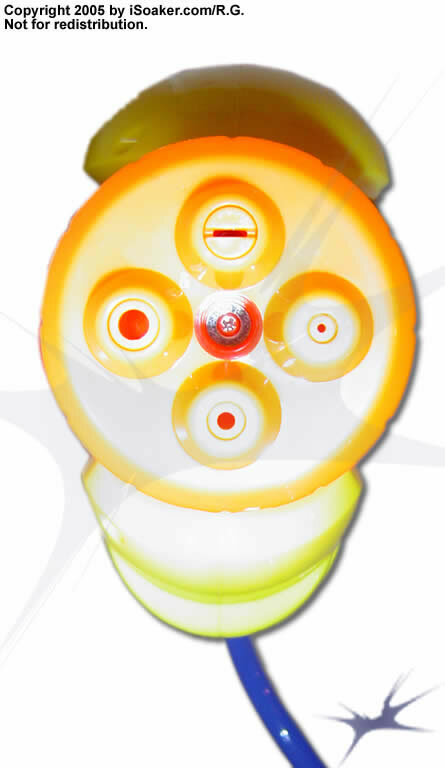 The reservoir backpack also houses the firing chambers: two CPS-like bladders that are contained within the bright yellow shell. The hard plastic shell appears quite durable, but the straps and strap holders feel a little weak and may be prone damage if one is not more careful. The base of the reservoir where the hose is attached can be opened for cleaning, draining, or repair. Because of this, one also needs to ensure the base attachment is well sealed prior to loading and pressurizing the pack (otherwise one will find water being ejected from the base). The fill-port for the reservoir is mounted on the top portion of the reservoir. While this allows for a more complete filling of the reservoir, it also means the backpack must be held upright during the filling process. As this is done more easily with the blaster resting on the ground, it is nice that two orange tabs were built onto the hose-connection adapter to prevent the hose from being crushed by the reservoir as it is filled. The reservoir plastic is semi-translucent and, in bright light, one can make out the approximate amount of water within it. The pump for the Hydra Pak pushes a good amount of water with each stroke. The pump actually appears to be dual-pistons, each piston feeding one of the internal pressure chambers with water. While not difficult, pumping does take some effort, especially as the internal bladders reach their maximum capacity. The pump also features a locking device at the top of the backpack. After fully pumping up the pressure chambers, the pump handle can be securely locked down onto the top of the reservoir to prevent it from moving while the backpack is being worn. It takes between 30 and 40 pumps to top off the firing chambers. As a whole, the Water Warriors Hydra Pak is a great backpack-based soaker. As an interesting mix between a pumpable and pump-free blaster, the strength of the design is that one just needs to pump a lot a first, then one gets a good amount of firing time until one needs to pump up again. With a large pressure chamber and good nozzle selections, the Hydra Pak can certainly hold its own on the water warfare field. Just be wary when one's stream starts to fade since re-pressurizing is a little more involved than the typical soaker. Long shot times and good power. Large pump volume. A pump-up'n'forget-type soaker. Great capacity reservoir. Weight of blaster on shoulders making it less of a burden. Largest nozzle feels underpowered. When out of pressure, must remove backpack to repressurize. Backpack straps feel somewhat awkward due to the shape of the clips.